You must make reservations at least 5 minutes in advance of the time at Sammy's Enoteca. 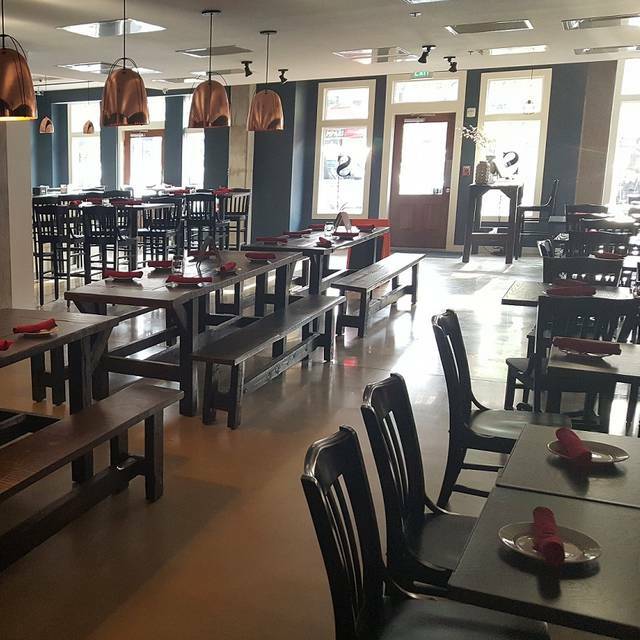 Rustic Italian Enoteca " Food and Wine/Full Bar, Open kitchen, spacious bar, Authentic Regional Italian cuisine Daily Homemade Pastas and Happy Hours highlighting different Wineries and Regions throughout the country. 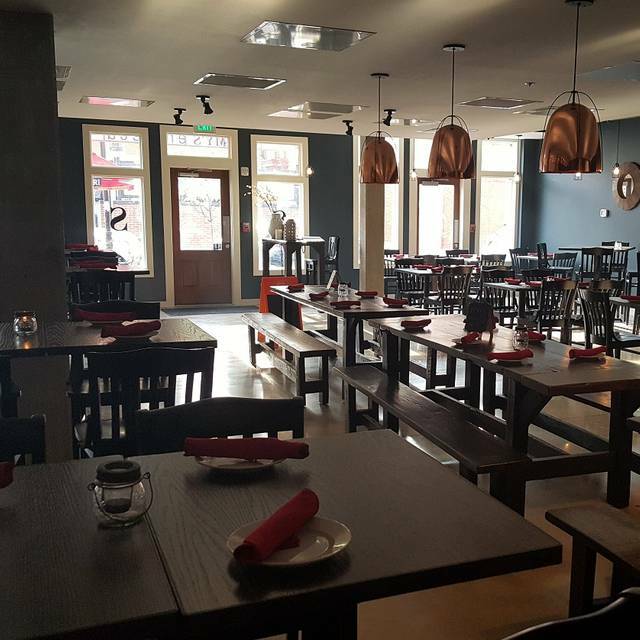 Small Plates and Traditional Family Style Dining"
Not nearly enough staffing - one server/bartender on a Saturday night! Service was very, very slow. Amatriciana was salty. Pizza was burnt and not good. Disappointed. I recommend this as a wine bar...the wine was great and the atmosphere was nice but the pasta was cold and underwhelming. We were a large group--not everyone's food came out at once and the server seemed flustered with our group size. Good time. Enjoyed the overall experience. Food options were great† and priced well. Good food and overall value. Kitchen close to early reservation was at 9 kitchen close at 9. How that work? The food is quite good. It is too bad they cannot grow an audience. I hope it can survive. Service was excellent. Food good, not great. Surprisingly empty for a Saturday night. The family style dining is probably the best option, but we weren’t that large a group. One of the worst experiences I have had at restaurant. It was almost completely empty and yet the waitress rushed us at every opportunity. She asked us what we wanted to order 4 times in less than five minutes. The food was mediocre and the service was terrible. Great service, a varied menu and delicious food. The atmosphere is perfect for two, or twenty. We love Sammy's. We were excited about going here as we haven’t been out in a while and the reviews on help were very promising. When we arrived we were seated immediately but it was very loud and we could barely hear each other. We were able to order drinks and they came quickly but when we ordered a Charcuterie plate and Arancini, it took almost a half hour to get our appetizers and it wasn’t that busy. Once we got our appetizers we ordered our meals, which we couldn’t order what we originally wanted as they had apparently run out of meatballs, it took about another 30-45 minutes to get our meal. As we were waiting we noticed that the chef in the open kitchen was picking food out of the pots and pans with his fingers and eating it and then picking his teeth. This really bothered us and we decided to cancel our order and end our night here. It is disappointing and alarming that such a thing would happen in an open kitchen, let alone any kitchen. It was also alarming that when ordering chicken or veal parm, all you received was chicken or veal with sauce and some cheese, no pasta or added side unless you paid 4+ dollars on top of the 17+ dollar piece of chicken. Unfortunately, we won’t be back. Our first time back since they opened and it was delicious! We love Sammy’s in Mt Vernon and would frequent often when we lived within walking distance because of the wonderfully authentic Italian food. I’m pleased to say this location was just as good! Food was delicious for sure. There were only two waitresses for the whole restaurant, definitely not enough. Also it was a little pricy for a casual dining spot. Your exterior has no presence. It is hard to find your restaurant, dull grey, confusing doors. You need a brighter paint color on the front, a bigger sign & some white lights? How about tables outside & plants? I hope this was an off night for this restaurant. Only highlights were the salads. Considering how long it took to get our entrees, we did not want to wait for them to be remade. The squid ink scallop pasta and tuna carpaccio are to DIE for!! It was amazing food and great ambiance! I would for sure recommend to a friend! All of the pastas are great. They them all! Really disappointed, especially after seeing all the 4- and 5-Star reviews. We had reservations for a party of 12. Upon arrival the table wasn’t ready; had to put tables together. The restaurant was not full - not even close. Food took a looooong time to come out. It was 40+ minutes for appetizers and over an hour for our entrees. When we said something, there was no sympathy for our wait - just, "Oh it's coming out." Service was mediocre at best. Had to request beverage refills, and with an open kitchen we could see the cooks working without a sense of urgency. Food was decent. I wouldn't come back, nor would I recommend it. Everything was great! Will definitely be back for date night! Great food and service yet, quiet. People are missing something great here. We found Sammy’s on Open Table for dinner on Monday night at 6:30pm. It was surprising to me that no one was in the restaurant other than the bartender and cook. We still decided to give it a try. The interior was nice and it was very clean. We were given some grilled bread with oil and Parmesan while we looked at the menu. About 5 minutes into our visit, the power went out on the whole block. They said they could still cook but couldn’t take credit cards. Luckily we had enough cash for our private dinner. We started with the Jimmy salad and burratta caprese salad. Both were good. Then veal Parmesan ( so fresh we could hear him pounding it before cooking it) and risotto with pesto and wild mushrooms. I’ve never had this experience, but it was delicious and I’m glad we went there. The chicken with lemon sauce and capers was fantastic! 2 people working. 1 bartender, 1 cook. Just a poorly sceduled night by restaurant owner. Wont go back. What a find! We went for dinner on a Saturday night with friends and ordered the family style meal. There was so much food it was amazing and every single course was delicious. We started with appetizers- including a meat and cheese platter and the most tasty mussels ever. This was followed by salad and then two pasta dishes. We especially enjoyed the squid ink pasta with scallops and roasted corn. After this we enjoyed two meat entrees (chicken and veal) and then homemade dessert. The wine selection was also wonderful and we enjoyed Italian Red wine with our dinner. In addition to the outstanding food, was the ambiance and server. Sally was so accommodating and friendly, in fact, we made a reservation to come back next month for our daughter's birthday. 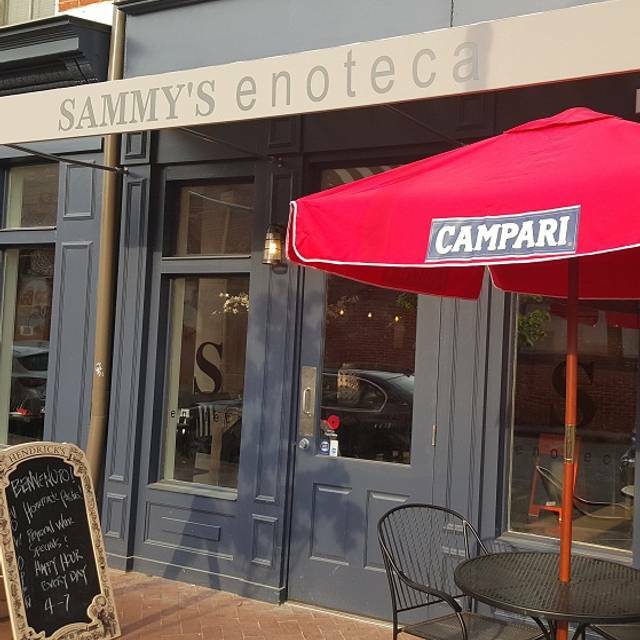 You will NOT regret visiting Sammy's Enoteca. Interesting, authentic menu, excellent service and well presented appetizers and entrees. Bring your appetite, the portions are large. We will return. Great service and delicious food. Staff goes above to please the customers. Food has great flavor with touches that add. Prices are very reasonable and portions are very fitting. Highly recommend. Once again - a great meal and evening at Sammy’s. I had the beef carpaccio for starters, then the veal francaise- awesome. Justin, the chef, is an artist. And the staff is warm and friendly. I feel like I’m eating dinner at a friend’s house. I enjoyed the food very much and also the service is very good. I definitely want to come back. Our reservation was apparently not on the books, but luckily there were plenty of tables were available. I was surprised that there were no specials on a Friday night, but the menu was extensive with lots of good choices. Everyone thoroughly enjoyed their food. However, they were greatly under staffed for a Friday night. Our server was very nice but he had far too many tables to be attentive to each one. I would come back b/c the food was good and it's a great place for a group of people. Service was terrible. They had 1 waiter, 3 managers, 0 bartenders and 4 cooks. Dinner took over two hours. Pasta wasn’t homemade. Portions were not that big. No excuse for this especially with so many other Italian restaurants in the area. They certainly know how to ruin a birthday dinner. Thanks to OpenTable discovered this amazing place! Food was amazing as well as service. Everything we tried was utterly delicious! Will come back for sure and recommend to friends. We came to Enoteca to celebrate an early NYE dinner. We are big fan of Sammy's so we thought that we would give this location a try. The food was superb. Both the Broccoli Rabe with Sausage and Meatball appetizers were great. I think we re-ordered the Meatballs as well. The entrees were tasty and plentiful. The only downside to this place was the service. We had to remind our server of drink orders / re-orders numerous times. Service was horrible overall but it has been much better at Sammy's Trattoria in Mt Washington. Great place for Italian in Fell’s Point. Food is excellent and staff is friendly and attentive. Nice informal decor. Definely worth a visit. Not the best wine list but the food was good. Great food from a menu with lots of good choices. The atmosphere in this newly-built space is slick-yet-comfortable. Great for a big group with kids. Servers were great! Food was delicious!